Christine Archer is a registered veterinary technician at the University of Ottawa in Ontario, Canada. She has worked in animal research for over seven years. She currently works with aquatic animals and reptiles in biological research. 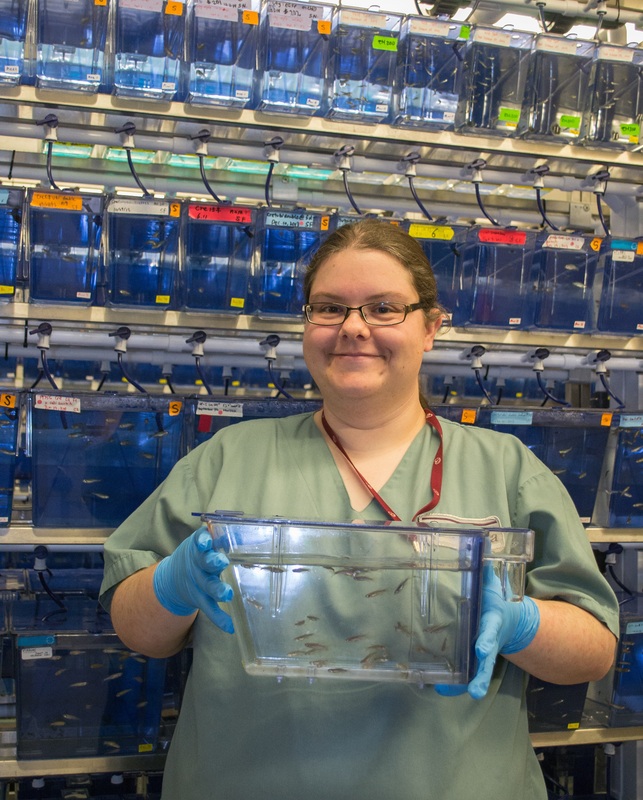 In this post, Christine looks at the interests and motivations that led her to become a laboratory animal technician, and her interest and love of aquatic animals. Fish account for 43% of research animals in Canada, with amphibians adding a further 3%. While I can’t say that I was ever a typical kid growing up in rural Canada, my surroundings definitely shaped my interests as I grew. I was always interested in the “gross” animals, from fish to frogs, and throw some snakes in there, too. I’d drive my mother crazy, catching animals in dubiously secure containers and bringing them home, only to have her insist that I take them right back where they came from. Just about the only exception was this big female wolf spider I rescued from a trough that ended up having an egg sac, which eventually resulted in many tiny spiders all over our house. I remember I’d also saved some newts from a tiny marsh that was being bulldozed for a new house. I hand fed them and kept them for years. They even went on vacation with us, in their not so dubiously secure critter keeper. All the while, I was also keeping many, many aquariums in my parents’ house, and breeding all manner of tropical fish. We had tanks in just about every room, even the bathrooms. After a false start in engineering, I ended up studying biology in university, but I was so enamored with all of the sciences that I couldn’t decide what I really wanted to do with myself. When I was finishing up my undergrad, my cat Monty got very sick. The process of his treatment and recovery got me very interested in veterinary medicine. While I was feeling rather burnt out by my university studies at this point, I looked into taking a college program that would offer me practical hands-on skills in addition to the science of veterinary medicine. I went to college for veterinary technology, eager to consume all of the veterinary medical knowledge I could, especially everything that pertained to those “weird” animals that I loved. In the middle of my program, I took an internship at a large medical research facility. This is where I found what I was meant to do with my life. Marrying my love for science and the scientific method with my newfound love for veterinary medicine. The only thing missing (so far) were the weird animals I am so fond of. I learned about rodents and rabbits and the nuances of their biology. I learned about the 3 Rs and how essential good animal welfare is to doing good science. Throughout my life, I’d always felt like the weird kid who stood up for the weird animals that everyone didn’t like. I was a voice for them. Now, in research, I realized that I can continue to speak for my charges, no matter what species they are. I finished school and became a Registered Veterinary Technician. I worked in cardiovascular research in a number of roles, working with traditional research animals like rodents and rabbits, and the occasional pig. It was great to be surrounded by colleagues who shared my interest in animal welfare and working hard to ensure that our charges’ welfare needs were being met every day. And then, one day, I got a call. The university’s aquatics and reptile facility needed an RVT for the summer, and my supervisor wondered if I would be interested. I couldn’t believe it. The opportunity to take part in veterinary nursing and the husbandry of all of those “weird” animals I’m still totally obsessed with? I’m there. However, I was reminded that it was only for the summer. Still, totally worth it. 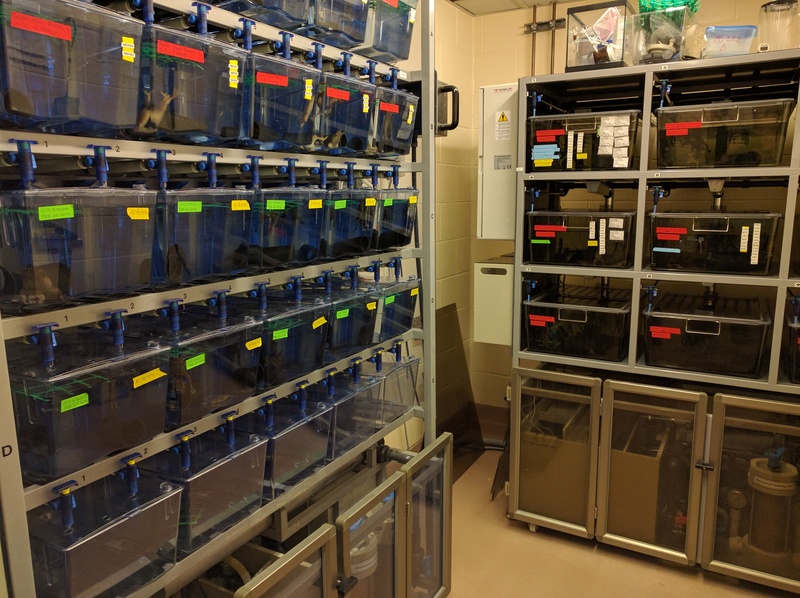 I said my tearful goodbyes to my colleagues at the rodent facility and started my position working with zebrafish, goldfish, trout, frogs, lizards, and even the occasional snake. That was more than three summers ago. I am still proudly caring for the veterinary and welfare needs of these animals today, as I was made a permanent staff member of the facility. I am so honored to be able to work with the animals I love, surrounded by passionate people working on everything from CRISPR research with zebrafish, to biomechanics work with fish that can walk on land. We still have so much to learn about these animals and their specific welfare needs, and I am thankful every day to be on the ground floor, working with colleagues who want to advance science while ensuring these animals, these weird, wonderful creatures, get the best possible care from the humans that depend on them. 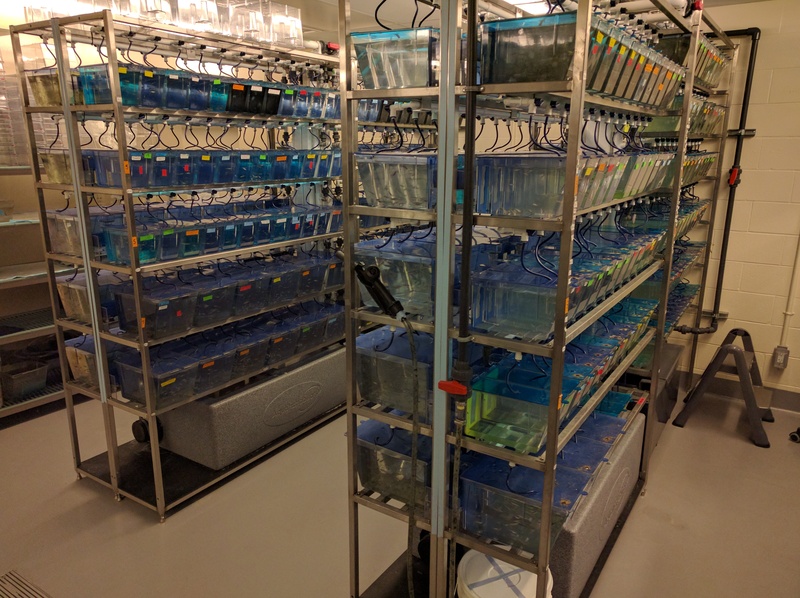 On an average day in my facility, I can be found setting up zebrafish breedings and collecting embryos, or culturing live food like rotifers and brine shrimp for the fish to eat. My job requires me to be adept at multiple skills, from understanding the husbandry and welfare needs for our many diverse animals, to working with our staff veterinarians on developing and improving methods to anesthetize fish and frogs. Animal welfare is very important to me, and I strongly believe that the quality of my work has a direct impact on the quality of life of the animals I care for, which in turn has an impact on the quality of the research that my colleagues can perform. I work every day with multiple researchers to help ensure they are able to do the best work possible thanks to animals which are healthy, happy, and leading enriched lives. I am proud to be a Registered Veterinary Technician in animal research, because I care very much about animal welfare and having the opportunity to speak for those who can’t speak for themselves is something I will never tire of. Posted on December 8, 2016 December 8, 2016 by EditorPosted in Guest Post, News, Science NewsTagged aquatic animals, Christine Archer, University of Ottawa, zebrafish.